MTC manages and coordinates several customer services to make it easier for you to move around the Bay Area. On highways, on public transit and even on bicycles, our programs help you get where you're going — safely and efficiently. 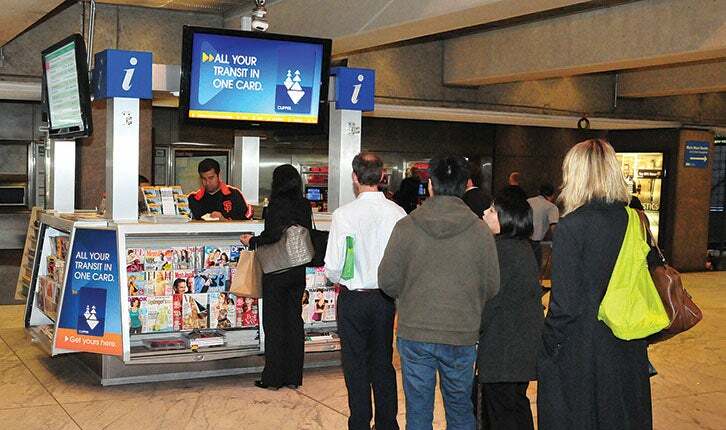 Commuters line up at the In-Transit customer service kiosk at the Embarcadero BART-Muni station. MTC is guiding development of a growing network of Express Lanes that uses the FasTrak electronic toll collection system to make Bay Area freeways more efficient, travel times more reliable, and the region's carpool lanes open to thousands more commuters every day. If you like statistics, you'll love the MTC Express Lanes Quarterly Report produced four times each year. The distinctive blue-and-white Clipper card can hold cash value, transit passes and more. Now accepted for fare payment by all Bay Area transit agencies, Clipper is developing more options for a new generation of customer convenience. MTC’s award-winning 511 information service helps you know before you go — with constantly updated information on traffic conditions and transit services plus rideshare matching and detailed bike route mapping. On the phone at 511 or on the Web at 511.org.